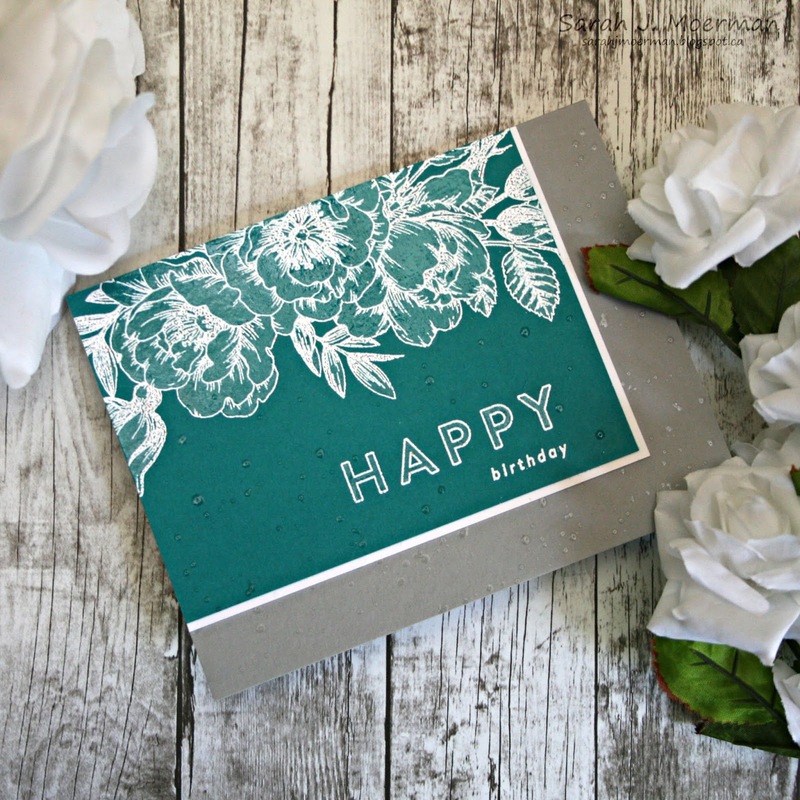 My Impressions: SSS June Card Kit Happy Florals Card & GIVEAWAY! What a beautiful card, Sarah!! The teal against the grey is so beautiful, love the flower image off the cardstock too! Such a beautiful card and stamp set! I am not familiar with the distress resist spray, but it looks amazing. Lovely card. So pretty! Love everything about this card!! This is such a wonderful card with the great distress spray! Oh my goodness, what a gorgeous card, Sarah! I absolutely love this floral image. Terrific kit this month. Love how the white embossed flowers pop against the peacock card stock. I haven't had a chance to try the Resist Spray yet, it adds some wonderful texture to the flowers. Oh how beautiful! 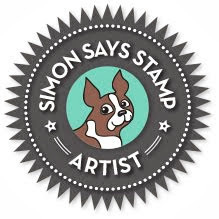 This kit is so incredible, and I love what you've done with the resist emboss spray! This is beautiful, Sarah! This kit has to be one of the nicest yet! So many awesome items in this kit! Love what you did with the stamp set! Love the monochromatic card! So easy to match right?? Lol! This kit looks like it would be amazing to create with! Your card is so pretty!! Simply beautiful, Sarah! 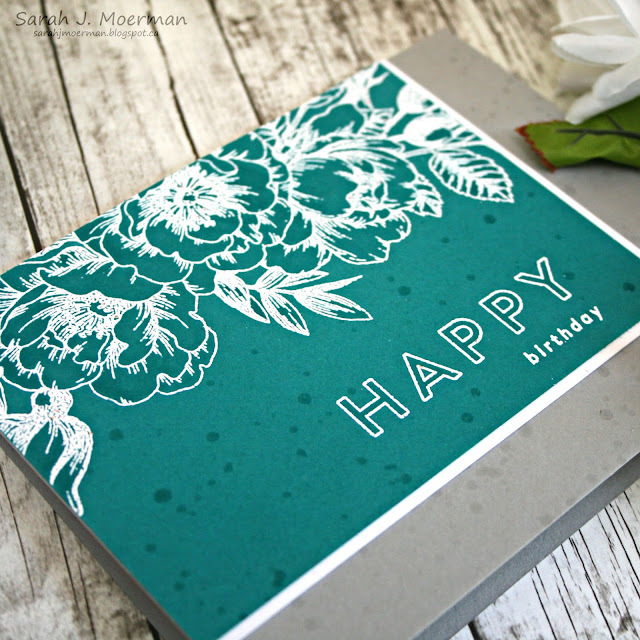 The white enbossed florals look so pretty against the new teal cardstock, and the resist spray gives a wonderful effect. This is such a great idea! Beautiful card! Stunning card and beautiful kit!! Really like the white on Teal! Thanks for sharing your take on the new Resist spray, Sarah. I have been looking at it but not sure how it works. Your card is so lovely! Fabulous colors & great design! Love the new teal color! Absolutely gorgeous card. 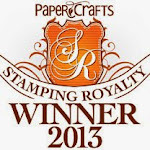 Totally in love with this stamp set, it's gorgeous and I love that elegant card! How interesting.....can't wait to give that resist technique a try! 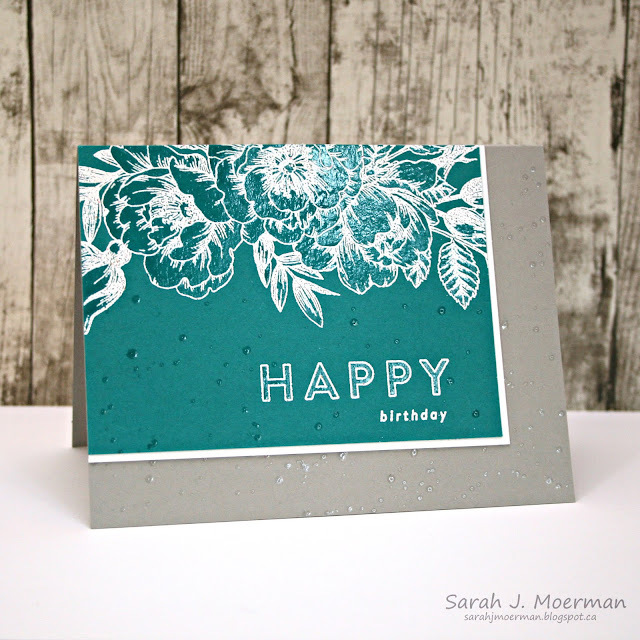 Love this stamping on the teal and gray! 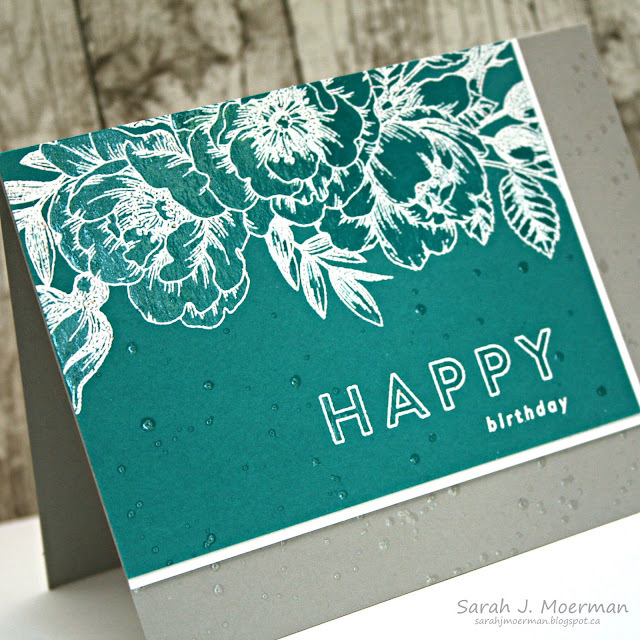 Love this color and the embossing over it is just amazing. So pretty card. This new peacock color is so pretty. Love this simple color palette. Such a pretty card. Love the shine and sparkle on the flowers. The flower image in the stamp set is very beautiful. And your card recaptures the detail in it. There is a reason, Sarah, they choice you to showcase the card kit of the months! Gorgeous card!! Love the look you get with the distress spray!! Stunning!! So glad I found you thus morning!! Love, love your style! Love this card - the colors and design are outstanding.